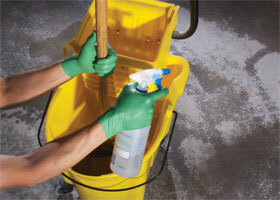 GreeN-DEX is a biodegradable disposable nitrile glove. It features Eco Best Technology, which accelerates the biodegradation of gloves in biologically active landfills and anaerobic digesters as validated by independent certified laboratories using internationally recognized test methods. The packaging of this glove is made from either recycled paper or 100-percent post-consumer waste.